Bull Power technical indicator is explained by Dr. Alexander Elder in 1989 in his book “Trading for a Living”. Three components are used in this technical indicator Bull Power, bear power and 13-period exponential moving average. I have written this post to explain the techniques of applying this indicator in forex trading. Generally, the histograms of Bull Power technical indicator remain positive. When the histograms turn into negative, it implies that the bear power takes the control of the market. In other way, when the histograms turn into positive from negative, it indicates that the Bull Power takes the control of the market. In the above image, we can see the upward histograms and downward histograms from zero line. A buy signal can be found when the histograms turn into positive, and a sell signal can be found when the histograms turn into negative. 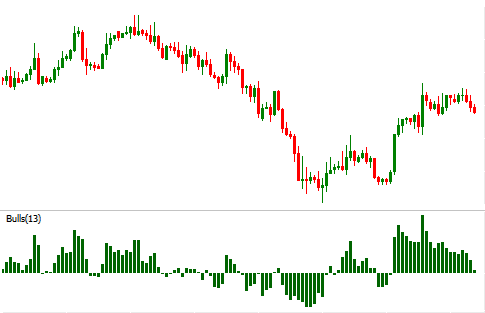 It is not necessary that the traders will only find the signals when the histograms turn into negative or positive ,rather the signals can be found even when the histograms make the ultimate top or bottom. The popular divergence and convergence techniques can also be applied with this Bull Power technical indicator. 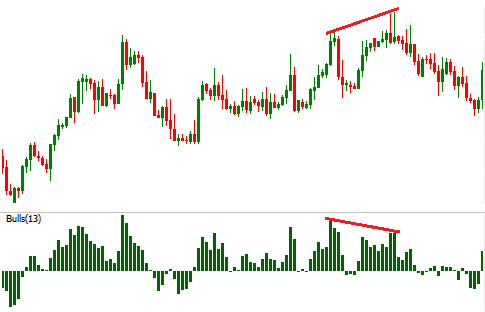 In the image below, you can find the way of detecting divergence and convergence with Bull Power technical indicator, and the linked post explains the divergence and convergence technique in detail. How to find a buy and a sell signals with Bull Power. How to apply divergence and convergence techniques with Bull Power. If you have any questions, you can ask me dropping a comment below.